The extent of our knowledge on the number of chemical compounds related to anthropogenic activities that can cause damage to the environment and to organisms is increasing. Endocrine disrupting chemicals (EDCs) are one group of potentially hazardous substances that include natural and synthetic chemicals and have the ability to mimic endogenous hormones, interfering with their biosynthesis, metabolism, and normal functions. Adverse effects associated with EDC exposure have been documented in aquatic biota and there is widespread interest in the characterization and understanding of their modes of action. Fish are considered one of the primary risk organisms for EDCs. Zebrafish (Danio rerio) are increasingly used as an animal model to study the effects of endocrine disruptors, due to their advantages compared to other model organisms. One approach to assess the toxicity of a compound is to identify those patterns of gene expression found in a tissue or organ exposed to particular classes of chemicals, through new technologies in genomics (toxicogenomics), such as microarrays or whole-genome sequencing. Application of these technologies permit the quantitative analysis of thousands of gene expression changes simultaneously in a single experiment and offer the opportunity to use transcript profiling as a tool to predict toxic outcomes of exposure to particular compounds. 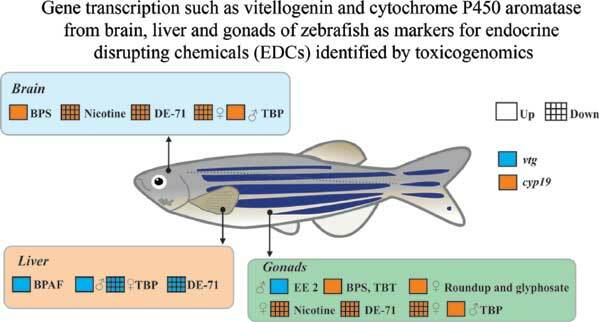 The application of toxicogenomic tools for identification of chemicals with endocrine disrupting capacity using the zebrafish model system is reviewed. Danio rerio, Endocrine disruptors, Environmental pollutants, Fish, Omics, Toxicity, Toxicogenomics, Zebrafish. School of Health Sciences, 550 Stadium Mall Drive, HAMP-1263D Purdue University, West Lafayette, IN 47907, USA.